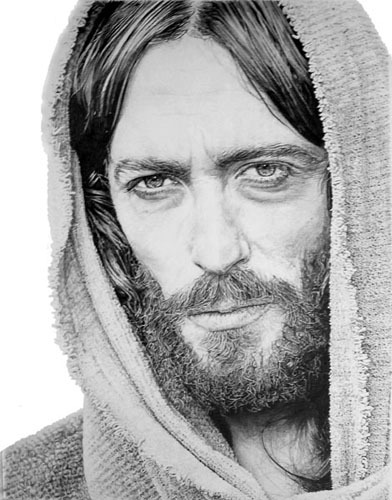 Based on the depiction of Jesus in Franco Zeffirelli's made-for-TV movie, Jesus of Nazareth, this pencil rendering was completed and printed as a limited-edition lithograph in 1978. By the mid-1980s, the edition of 1,000 prints had sold out. Then in 2007, more than twenty years later, the artist received a letter from a woman in Michigan who was cleaning out her garage and found ten copies of the print that her husband's ex-wife had taken from the artist on consign-ment so many years earlier but had never sold or returned. The recovered prints bear two digit numbers from early in the edition; and each of them has subtly tinted blue eyes. Nine of the ten, blue-eyed signed and numbered prints are available for $645 each. Serious offers on the original drawing, rendered with a 6-B pencil on clay paper, will be considered.